Lech and Zuers, known as the centers of alpine powder snow skiing, are ski resorts with a comfortable and cozy atmosphere. Situated at 1450 m/4757 ft, the 700-year-old village Lech creates a single large ski region with Oberlech, Stubenbach, Zug and Zuers, which is situated a little bit higher at 1720 m/5643 ft.
276 km/171 miles of slopes and 180 km/112 miles of off-piste runs offer a lot of diversity for skiers. Other winter sports such as cross-country skiing, snowshoeing or tobogganing are also part of the winter program. Breathe the fresh mountain air in summer when walking along the signed hiking paths around Lech. Take part in the village life as it’s quieter in summer than in winter. Enjoy the traditions, explore the nature and see for yourself why Lech was awarded “Most Beautiful Village in Europe” in 2004 by the “Best of Alps locations”. One of many reasons to visit this huge ski area is to ride on a chair-lift without freezing. In 2005, seven chairlifts installed “heated seats” and for the season 2006/2007 there will not be any cold seats. What a treat! 276 km/171 miles of slopes plus 180 km/112 miles of off-piste runs promise pure ski fun. 85 lifts and 10 cable cars bring you to the top. Snow is guaranteed from end of November until end of April. The slopes go from 2800 m/9187 ft down to 1450 m/4757 ft. Snowboarders are also welcome and find a fun park in Lech. 26 km/16 miles of cross-country trails are properly prepared. Ice skating lovers find ice rinks in both villages Lech and Zürs. If you feel more comfortable on your feet than on skis or skates, take a stroll on the prepared winter footpaths or try to play some Bavarian style curling. If you love to walk through the untouched winter wonderland, join a snowshoeing tour and enjoy the beauty of nature. There are 2.5 hours walks and even full moon tours available. Experience this very special tour. You will not regret it. Horse drawn sleigh rides are a way to relax your sore muscles after a day of hard skiing. Lean back and enjoy the wonderful winter landscape while sitting under warm blankets. Especially families love the floodlit toboggan run from Oberlech to Lech. No need to bring your own toboggans along, they can be hired. In summer, life is quieter in these two Alpine villages. Participate in the village life and experience some traditions. These villages were able to keep their homely character and put quality over quantity. Hike along the 250 km/155 miles of signed hiking paths and explore the beautiful landscape. If you are lucky, you see some marmots. Don’t worry, they won’t harm you. They just like to whistle. Make sure to stop at the restaurants and sample some local specialties. The area Lech-Zürs is a great place to mountain bike (get some maps of tours at the local tourist office), to climb or swim or even to fish at the “Spullersee” or “Formarinsee”. If you are courageous, take the cable-car to the “Rütikopf” (2350 m.ü.M./7710 ft) and paraglide alone or in tandem flight. See the area from above. What an experience. Tennis, Squash, table tennis or climbing at the climbing wall are offered in the Tennis hall in Lech. If you love to do Nordic Walking, the tourist office suggests special routes of various length and difference in altitude. 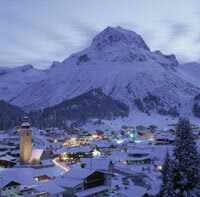 Situated in the Tirol, Lech and Zuers are approx. 120 km/75 miles from Innsbruck which is also the closest airport. Zurich is 200 km/124 miles and Munich 330 km/205 miles away. There is a train station at Langen am Arlberg, which can be reached in 20 minutes by taxi/bus.